This ZIP file contains all of my Water resource pack files – Natural Resources, renewable resources, non-renewable resources, uranium, solar power, hydroelectric power, biomass, geothermal energy, wind energy, tidal energy, global warming, fossil fuels, reduce, reuse, recycle, conservation, soil, air, water. 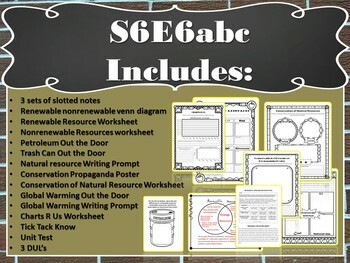 This bundle includes ppts, graphic organizer, worksheets, Unit Test, Activities, summarizers, and DUL's Did you Learn Activities for the Georgia S6E6abc standards and elements. Standard: S6E6. 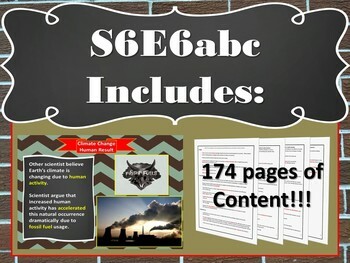 Obtain, evaluate, and communicate information about the uses and conservation of various natural resources and how they impact the Earth. Element: a. Ask questions to determine the differences between renewable/sustainable energy resources (examples: hydro, solar, wind, geothermal, tidal, biomass) and nonrenewable energy resources (examples: nuclear: uranium, fossil fuels: oil, coal, and natural gas), and how they are used in our everyday lives. Element: b. Design and evaluate solutions for sustaining the quality and supply of natural resources such as water, soil, and air. 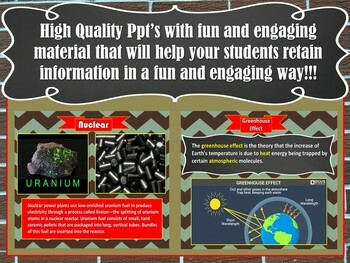 Ppt's cue teacher of what and when the worksheets need to be given and is very self explanatory and easy to understand. 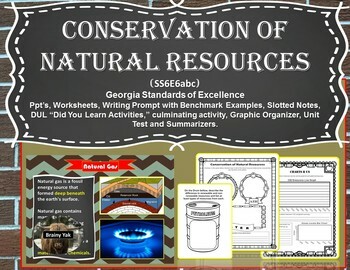 The files is aligned with the Sixth Grade Science Georgia Standards of Excellence Standards (Next Gen) but majority of this could be used at a lower grade level. Other Items related to this unit are below.